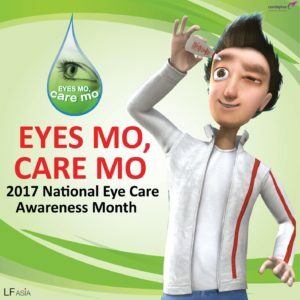 The 1st National Eye Care Awareness Month in the Philippines dubbed as EYES MO CARE MO kicks off this May in different cities. This is the very 1st campaign that aims to emphasize the importance of taking care of our eyesight. Eye Mo Philippines entrusted this important campaign to Firestarters Productions. EYES MO CARE MO campaign was able to reach to more than 4 Million Filipinos in Metro Manila, Pampanga and Cavite through the fun and exciting activities that happened in Manila (SM Manila) on May 17, Quezon City (LRT Santolan) on May 18 and Cubao (MRT Station) on May 24 and Cavite (SM Dasmariñas) on May 25. The campaign also won an accolade, the very 1st Nicholas Halls Awards for the Philippines and the Asia Pacific Region. Nicholas Halls Award, Achievement in 360 Marketing for OTC (over the counter) products.